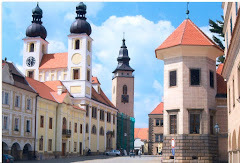 This Church, the Karel Boromejsky Church, Orthodox, also known as Church of Saints Cyril and Methodius, * was instrumental in Operation Anthropoid, the assassination of the Nazi Reinhard Heydrich by Czech partisans on an allied mission. 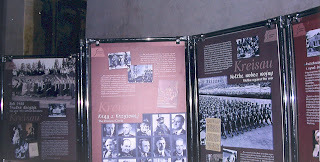 The partisans, betrayed by other Czechs, were hidden by the priests here, then were trapped and killed. The members of the team that conspired and carried out the mission successfully are at the left in the photo exhibit there. They are heroes to many Czechs. See www.radio.cz/en/article/28416. Some disagree because of the horrific extent of the later reprisals, see the mass murders at Lidice at www.historyplace.com/worldwar2/holocaust/h-lidice.htm, for example. The partisans were paratroopers and held out in the crypt at the church, in New Town. There are bullet holes still in the outside walls, and the crypt area. Find it with a simple Images search for Bormejsky Church. There are photos of Heydrich also there. See a detailed account, with graphic photographs of events prior, during and the reprisals afterwards, at www.militaryphotos.net/forums/index.php. 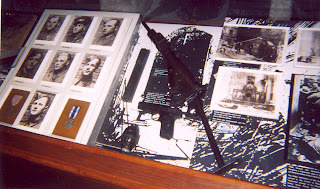 There it is - at the entry labeled "
THE GERM-BOMB ASSASSINATION OF REINHARD HEYDRICH"
Here are some of the news photos and accounts at the Church. 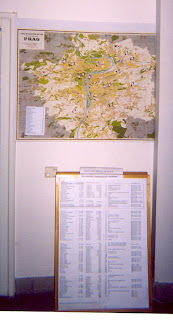 And below is the map of Prague, showing the safe houses - many of these had been betrayed by a Czech turncoat, leading to information of the location of those carrying out the assassination. The pins represent the safe houses during the war. That lower level is now a shrine, with the story told in maps and exhibits, and entry provided into the crypt itself. Petr Ginz. Read his account. He was there in Prague at the time. See Places of Petr Ginz. In "The Diary of Petr Ginz 1941-42," Atlantic Monthly Press 2004, translation into English 2007, read his daily logs and other writings. He was about 13 at the time. Page 108 27.V.1942 (Wednesday) through page 114 20.VI.1942. Imagine your own child living in those times. He writes, here in summary, that there was a bomb assassination attempt, a state of emergency declared, orders to stop or be shot, reward for information and shooting of the person and family if there is holding back, 8 people shot for harboring unregistered people, naming a person sought, 45 people shot for publicly approving the assassination, more rewards from SS and the Protectorate government, 18 more people shot for hiding unregistereds, 250 Jews shot, 250 deported to concentration camps, school closed after (he thinks) someone was shot looking out the window, older girls taken and their hair washed because the Germans were looking for a blonde who assisted the assassins, attacks in Berlin and 250 Jews shot and 250 more to concentration camps, flags at half mast for the (believed) death of Heydrich, confirmation of the death, Jews can't go out to many places, train carrying the body gone to Berlin and buried, big massacre near Kladno where apparently a transmitter was found, and so on. Then the deadline for the assassin to give up or be handed over. One might be caught already. And then, "I heard they caught the assassins in Boromejsky church. The chaplain hid them there. When Eva (Petr's sister) walked past it she heard shooting ad she saw shattered windows. Again they executed 153 people." Petr Ginz at page 114. Of interest to Hartford, Connecticut, where Colt guns were made. One of the weapons used in the assassination was a Colt. That is stated in one of the glass-enclosed exhibit boxes. See also www.timelapse.dk/models.php. See also www.army.cz/images/id_7001_8000/7419/assassination-en.pdf. See the exhibit at the State Library, www.cslib.org/coltarms.htm, and its military history at www.colt.com/mil/history.asp. * That Boromejsky Church where the partisans were killed had been dedicated to the Saints Cyril and Methodius. Cyril and Methodius were brothers who came from Thessaloniki, Greece, in about 863, and originally converted the Czechs and other now Eastern European national groups to Christianity. Later, when the Roman Catholic branch of Christendom split from the Orthodox, the Roman branch overcame (read, killed) the Orthodox who had not been converted through them, see post on the Teutonic Knights in Poland Road Ways in Poland, and James Michener's book, "Poland."